There are a lot of factors which determine the performance and safety of an overhead or roll up garage door. One of them is the force with which it is lowered and raised. If this force is not properly adjusted, the door can slam or hang above the ground. In either case, there is a safety risk and a risk of damage as well. Find out what you have to do in order to ensure the proper operation of the system. Our garage door repair experts in Redington Shores suggest that you test the force of the door every two months to ensure effective and safe operation. If this is not possible, you should test it at least in the beginning of every new season. This is important because wood doors, in particular, change their weight seasonally. During the wet fall and winter months, they become heavier due to the moisture. When the weather is dry, they are considerably lighter. 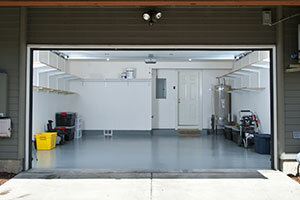 In general, the adjustment of the force should be part of your garage door maintenance schedule. In order to know exactly whether you need to adjust the force up or down, you have to run simple tests. In order to test the downward force, you need to start lowering the door and hold it while it is half way though. If it feels heavy and does not reverse quickly, the force has to be reduced. If the door bounces back when it hits the floor, the force has to be increased. Generally, before you run these tests you need to provide garage door opener sensors maintenance to ensure that the safety reversal mechanism functions properly. You need to test the upward force, in the same way but when the door is travelling up. If you hold it with your hand when it is moving up, it should stop. If it does not, you need to decrease the force. If the door does not open to five feet above the ground during the opening cycle, the force has to be increased. The control knobs for adjusting the force are found on the back of the garage door opener. This is the case with virtually all brands including popular ones like Genie, Lift Master and Wayne Dalton.